This feels like a replacement for the soon to cycle out Restructure. In exchange for being terminal IPO is 2 cheaper to active and gives the same profit (5) as Restructure. Since it's terminal it's not a card that will help you advance your game plans in the turn that you draw it but it does help with rezzing ice on the runner's next turn. Obviously Weyland Consortium: Building a Better World also loves to IPO. IPO is substantially better than Restructure, which is the obvious comparison. At just 2 cheaper, it's far easier to play this in the early game. A first turn of ICE-ICE-credit sets up for a turn 2 of credit-credit-IPO, or you can ICE, Hedge Fund, IPO on your first turn out of every ID (instead of just HB ETF & BABW). It's amazing what a slightly cheaper play cost will do for a card. The terminal restriction is notable. It means you can't burst up in credits to land a Midseason Replacements, Hard-Hitting News, or SEA Source. Still, decks that care about a credit advantage will probably want to play IPO for its sheer efficiency. Think of all the turns you needed to go "credit-credit-Restructure"—the prohibitive play cost made it already a terminal in some situation. 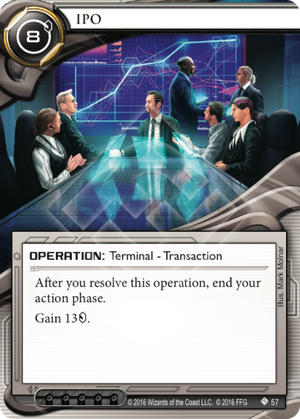 IPO is one of the most playable, least exciting cards out of Terminal Directive. For a short while before rotation, we'll have more operation economy than ever in the game, boosting IDs like Palana Foods, BABW, & New Angeles Sol.